We are a nationally accredited innovative education leader that partners with local school districts to help young adults overcome real-life challenges to earn their district or state-issued high school diploma. Our learning environment provides exactly what research shows students need to be successful: engaging courses, technologically advanced educational tools, and personalized curriculum. •Web-Based Curriculum: Which allows our Graduation Candidates (GCs) flexibility to work from anywhere with a Wi-Fi connection. •Individualized Learning Plans: Which are tailored to each GCs individual schedule and needs. •Focus on the Next Step: Via personalized life & career coaching to help our GCs find the path that’s best for them -- whether that is college, the military, skilled trades or a career. •Flexible Instruction: our staff of highly qualified paraprofessionals and certified teachers work with GCs in small groups or in one-on-one settings, creating opportunities to develop substantial relationships and drive academic progress. 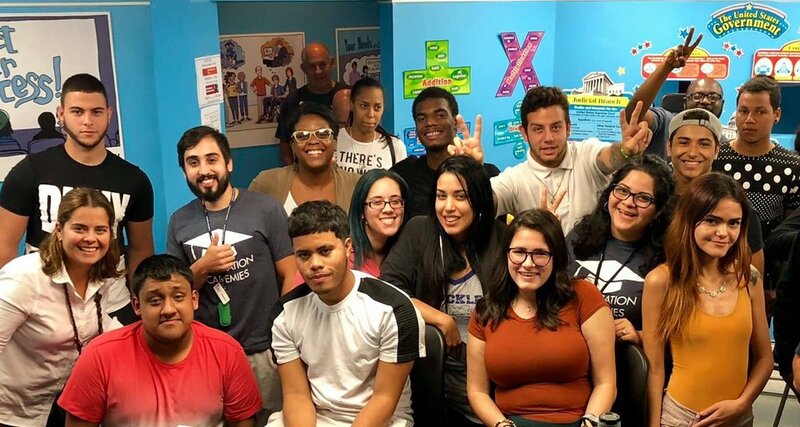 •Sense of Community: Our academy prioritizes a personalized approach with all GCs so that these young adults can connect with mentors and foster relationships with caring adults allowing them to build a connection and giving them a safe, supportive place to learn and thrive. •Transportation: Options include vans which allow GCs to schedule transportation and public bus passes which help GCs get to school, work, or other areas around the community. •Food Services: We partner with school districts to provide daily food services to all who qualify and also provide a variety of snacks and drinks in our sites to fuel our GCs for success. •Family Friendly: Many of our GCs are caretakers to families of their own. Our extended hours and unique approach allows GCs the flexibility needed to manage kin-care without jeopardizing academic commitment. •Connections to Community Services: We have connections with many local businesses and our network connects GCs to resources beyond our facilities. Acceleration Academies is ready to help you earn your high school diploma, whether you are one credit or many credits from graduation. Despite these circumstances, Acceleration Academies is prepared to assist GCs on their path toward earning a High School diploma! Any potential Graduation Candidate under 18 must bring a parent or guardian with them for enrollment. Upon initial enrollment in a school, the Graduation Candidate or parent must produce two current (within 90 days) documents reflecting the correct residential street address. To learn more about the research behind our program, click HERE. Learn more about the difference between a GED and a high school diploma, HERE.